As a veterinary practice that is prepared to meet any veterinary need your dog may have, Riverbark Veterinary Hospital is equipped with a laparoscopy unit. We take pride in the fact that our patients undergoing laparoscopic surgery experience less pain and a significantly reduced recovery time versus many types of classical, open abdominal veterinary surgeries. To perform veterinary laparoscopy, a veterinarian cuts a small incision, the size of a keyhole, in the dog's belly. A special miniature laparoscopic camera is then inserted into the hole. Real-time photo images from the camera are displayed on a monitor, allowing the veterinarian to view individual organs inside the dog and to guide their surgical instruments. 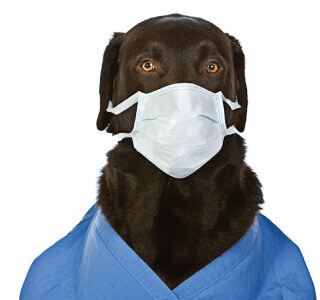 What is beneficial about keyhole surgery for dogs? What procedures are candidates for laparoscopic surgery? Ideal candidates for laparoscopic surgery are lean and weigh at least 30 pounds. Is laparoscopic surgery more expensive than open surgery? Laparoscopic surgery for dogs is more expensive than open abdominal surgery, but in certain cases the benefits outweigh the cost. Is laparoscopic surgery covered by pet insurance? With all of the advantages of laparoscopic surgery for dogs, it is refreshing to learn that in many cases pet insurance treats the procedure the same as open surgery. However, laparoscopic surgery for dogs might not be covered the same by every pet insurance company, so it is important to check your policy or contact your insurer to ensure that you are covered. Laparoscopic spaying for dogs is an elective procedure, and whether open or keyhole, is not covered by pet insurance. However, the cost of laparoscopic spaying for dogs is usually only slightly higher than traditional spaying. The surgical neutering of male dogs that have a retained abdominal testicle (called a cryptorchid) is often covered by pet insurance, and this too may be performed by laparoscopic surgery for dogs. Please contact us to learn more, or to schedule an appointment to discuss laparoscopic surgery for dogs with one of our veterinary team members today.